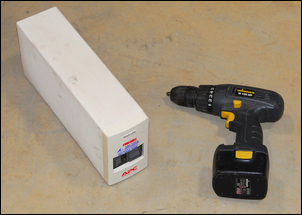 Got a cordless battery drill that has a stuffed battery? Like to have a light-weight, effective and very cheap hand-held drill? The answer is easy: just salvage a few parts from the tip or garage sales and you can have a new and effective tool. And it’ll cost you nothing – or near-nothing. Furthermore, the drill will usually last a lot longer between charges, and by mixing and matching voltages, you can give yourself a more powerful tool. This story started when I built a large home workshop. The shed, 14 x 6 x 3 metres, used Colorbond walls (ie coated galvanised sheet) and a galvanised sheet steel roof. Erecting the shed required the insertion of literally hundreds of Tek screws. To perform this task, what was needed was a good power tool. 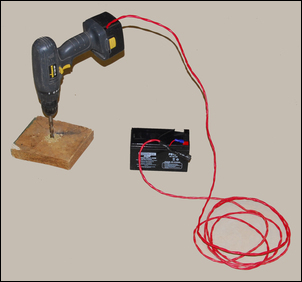 After looking at commercially available – and expensive – battery-powered and mains-powered electric drills, I decided to rig up my own. It was initially going to be used to just insert all the cladding Tek screws, but in the end I also used it to drill holes for the installation of the roller doors and pop rivets on the trim pieces. I wrote a story about building the workshop (see Building a Home Workshop, Part 4), one that in passing described the drill – and immediately started to get emails asking that I detail how I made the tool. So here is the process – and it’s very easy. 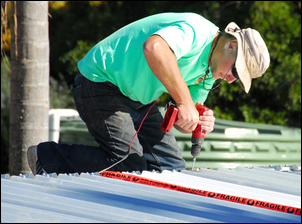 You’ll need a drill that has a worn-out battery, and a Sealed Lead Acid (SLA) battery. The drill is easy to recognise in the pic, but what’s the cream-coloured box? It’s an uninterruptible PC power supply. 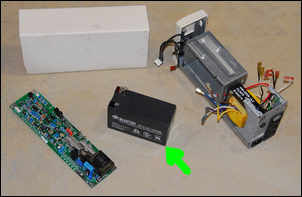 Uninterruptable power supplies invariably use SLA batteries, with a small unit like the one shown here having only one SLA battery, and larger ones having four or even six of batteries. 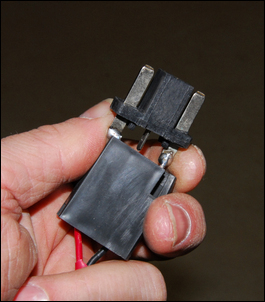 In most cases (but obviously not all) you can salvage a good, working SLA battery from these devices. Uninterruptible power supplies can be found at garage sales and the tip. 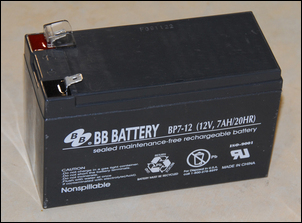 SLA batteries can also be found in discarded kids’ electric scooters. 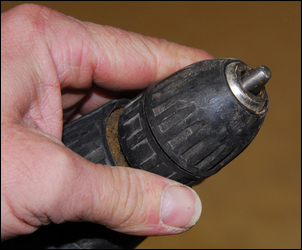 If you’re selecting a drill for re-use, inspect the chuck closely, making sure that the jaws close evenly and that they’re not serrated or scored. Spin the chuck and the drill should turn fairly easily, without any grittiness or excessive noise. 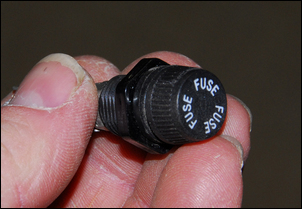 You should use a fuse – without it, a short circuit in the finished design could cause a fire or even burn you. 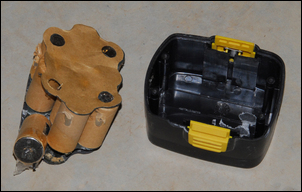 Fuse holders are available in almost any salvaged consumer goods – especially older ones. 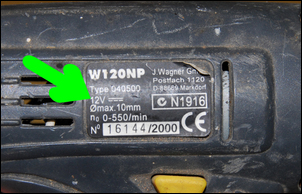 While a portable drill can easily draw 20 amps when stalled, in most use a lower rated fuse will still be fine – you don’t tend to stall the drill for very long at a time. This fuse holder came with a 7 amp fuse – and that’s what I left in place. It hasn’t blown yet! 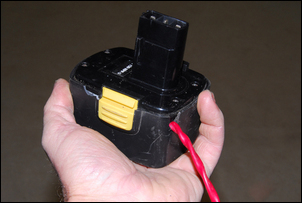 Pull the uninterruptible power supply apart and remove the battery – or batteries. Often you don’t have to fully disassemble the unit but I did so because I wanted to salvage the front panel switches and keep the metal box. Note: while you may wish to keep the UPS electronics working (it will trickle charge the battery), don’t do so unless you know exactly what you are doing – the mains power inverter (also contained in the box) can give a lethal shock. Here’s the salvaged battery. Now this battery proved to be stuffed: it wouldn’t take a charge. However, I have no less than 12 other SLA batteries of the same size (all salvaged from uninterruptible supplies), so I just grabbed another off the shelf. Not one of those dozen other batteries was dead beyond use when it was salvaged, so I reckon the chances of success are well on your side. 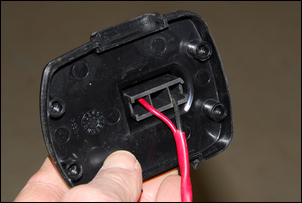 Cut the connecting wires and then remove the dead cells, keeping in mind that they might not be actually completely dead – so don’t short-circuit the output terminals! Dispose of the old batteries appropriately. In the case of the battery pack I was working on, the connector pulled out of the back of the upper panel of the pack. This made making the new connections to the external SLA battery very easy. I soldered the wires from a twin cable to the connector. You could also use crimp terminals. The cable that you use should be reasonably thick in copper – otherwise, there will be too great a voltage drop and the drill’s power will be reduced. However, in both this drill and the ‘shed build’ drill, I just used any old cable I had lying around the place – I didn’t try to source especially heavy cable. Twin core cable (or even single core cable – just tape two together) appears all the time at the tip and garage sales. 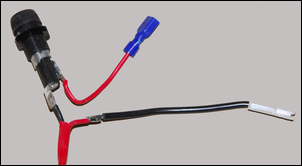 (However, don’t be tempted to use the very thin speaker wire that also appears at these sources very frequently!). 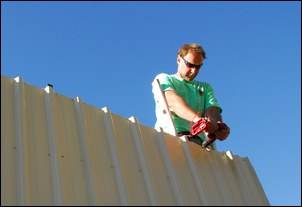 Make the length to suit your use – if you intend climbing a ladder, the cable will need to be longer than if you’re using the drill just on the bench. Once the wires were soldered to the connectors, the connector block could be reinserted into the old battery housing. I used a little instant glue to ensure it stayed in place, even without the original battery back beneath it to help hold it in place. 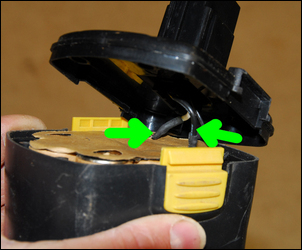 A small opening was filed in the side of the original battery container and the cord could be fed out through it. I also placed a cable tie around the cord so that the cord could not be pulled through the hole and so place tension on the soldered connections. 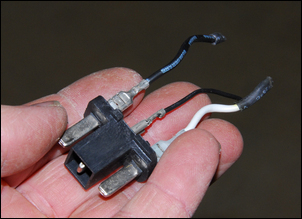 The fuse goes in series – it doesn’t matter which wire it goes in. If you look at this pic closely, you can see I changed the colour codes of the wiring. This was because when I connected the drill to the battery, I found I’d swapped the wires around and so the drill wouldn’t work with red connected to positive. Reversing them across the fuse meant that the red wire now connects to positive. Make sure that this is the case, because most times the battery will be unplugged to charge it and when you reconnect it, you want to get it right each time. Finished! As can be seen, with the 12V SLA battery feeding the nominal 12V drill, the drill can chomp through particle board, even with a large drill bit. It’s also fine for inserting Tek screws, drilling smaller holes in metal, and so on. It reverses just as it did originally, and the adjustable clutch can also still be used as standard. But what about charging the battery? There are two ways you can (again) do it for near-nothing. The first is detailed at Zero Cost Trickle Charger. 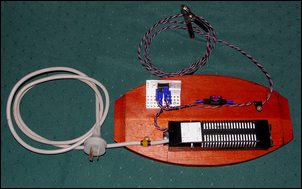 This approach uses just a cheap 12V plug-pack (wall wart) and a resistor. 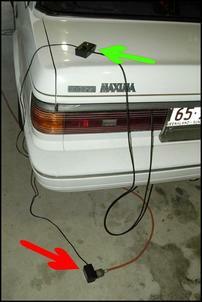 Here it is being shown charging a car battery but just the same approach will work on a 12V SLA battery. Unlike lithium ion and nickel metal hydride batteries, lead acid batteries are pretty tolerant of simple chargers. If you want a faster rate of charge (and still don’t want to pay anything), you can do it this way - Dirt Cheap DIY Battery Charger. This design will typically charge one of these batteries in 3 or 4 hours. Of course, if you have more than one SLA battery, all you do is swap them over, replacing the flat one for one that is already fully charged. This is certainly not a project for everyone. But if you already have some of the major components, and can cheaply and easily acquire the others, it makes for a very good outcome. I just love using my electric drill. It runs for a very long time on one charge, is safe in all weather conditions (even with water lying on the ground), and if you’re using it to insert hundreds of screws (or drill hundreds of holes) is very low in fatigue – primarily because it is so light.